Skoon began online in 2001 where a gallery website was created to showcase original art, mainly from the Isle of Harris and Outer Hebrides. 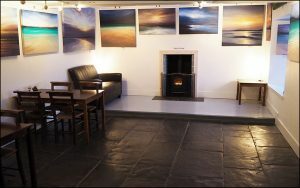 In 2005 the Skoon Gallery opened in Geocrab in the Bays of Harris and a physical exhibition of original art began and has been ongoing since. Skoon exclusively exhibits original work by resident Artist Andrew John Craig. Andrew and Emma live and work in the premises all year round. We offer leaf tea and freshly ground coffee along with a small selection of cakes in the Gallery. More information can be found on skoon.com.